Since 2006, Taber's Black Belt Academy has been providing instruction in Taekwondo and Tai Chi in the Morganton, NC area. Translated from Korean, "Tae" (t'ae) literally means to jump or kick or smash with the foot. "Kwon" denotes a fist - chiefly to punch or destroy with the hand or fist. "Do" (doe) means an art, or way or method. Thus taken collectively "taekwon-do" indicates the technique of unarmed combat for self-defense, involving the skilled application of punches, flying kicks, blocks, dodges and interceptions with the hands, arms and feet for the rapid destruction of the opponent. To the Korean people, taekwon-do represents more than the mere physical use of skilled movements. It also implies a way of thinking and life particularly in instilling a concept and spirit of strict self-imposed discipline and an ideal of noble moral re-armament. Taekwondo is primarily a kicking art, often with a greater emphasis on the sport aspect of the art. Taekwondo stylists tend to fight at an extended range, and keep opponents away with their feet. It is a hard/soft, external, fairly linear style and is known for being very powerful. There is a lot of competition work in many dojongs. 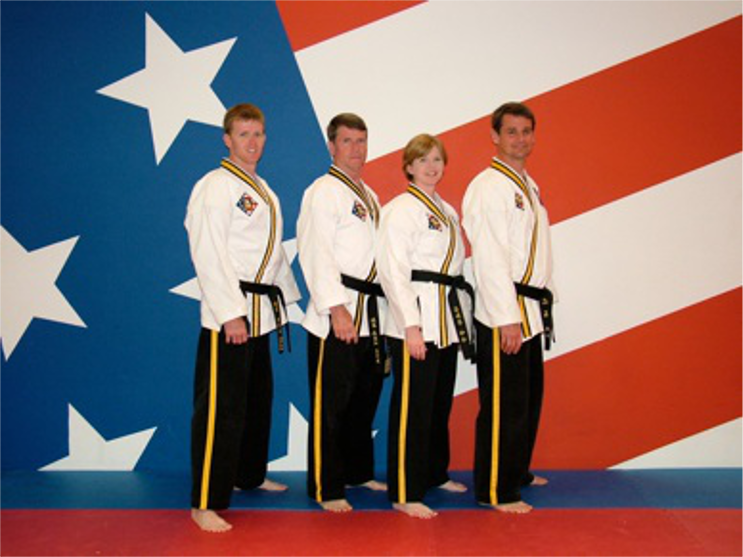 We train in all aspects of Taekwondo including self-defense, board breaking, sparring, forms, and weapons. Through these tenants we believe you will gain not only skills for your martial arts journey but life skills in general. Developed the AMAI Adult Leadership Curriculum taught nationally in AMAI affiliated schools. Developed the AMAI Tai Chi Curriculum and instructor program taught nationally in AMAI affiliated schools. Glenn Olson has over 20 years of experience speaking to small and large groups of elementary children on the topics offered through his program Safety N.E.T. Kids – No Easy Targets. His mission is to help children learn specific responses to real threat whether it is from a stranger, bully or someone they know. At Taber's Black Belt Academy we strive to continue traditional training methods taught to us by our master instructors. To put it simply the traditional training methods work and that is why they have been used for thousands of years. One step at a time we build a strong foundation for solid self defense and confidence to be built on. Our training facility is a safe and effective environment for students to develop and grow it is a place where you can learn more than just how to punch and kick, you can learn to be strong and confident enough to be yourself.